Finally... the perfect balance between flats, bay and light offshore fishing. Meet the all new Avenger 24 Pro-Series custom fishing boats from Marauder Marine Boat Works. Engineered to meet the high demands of fishing guides and avid anglers alike, the new Avengers use cutting edge technology and the finest materials on the market today to create a smooth, dry riding machine, responsive precise handling that will get you there first. 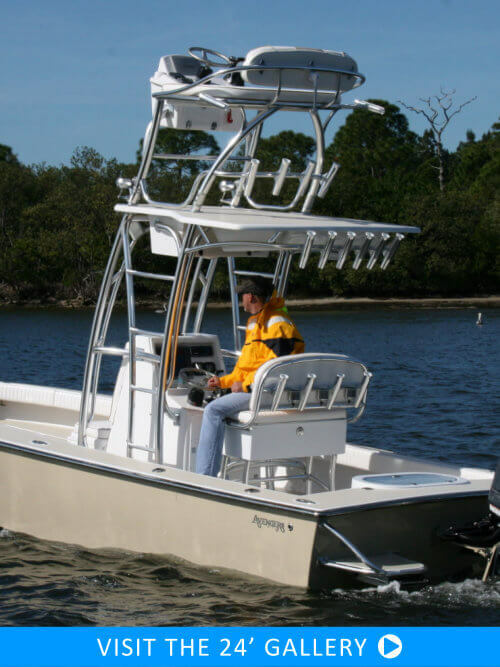 Crafted by a team of professionals led by avid fisherman, marine craftsman, and lifelong boater owner David Graham states, "The new Avengers come with a broad array of standard features to meet the needs of the discriminating boater. Fresh from the factory you are ready to hit the water and go. Of course, the options to supersize your new machine are endless from custom hull color, horsepower options, bright work/tower configurations, electronics, power poles, sound systems, LED lighting packages and more... It all begins and ends with your imagination. Custom Fishing Boats at their finest." The all new Avengers incorporate an extraordinary balance between a professional guide boat, avid angler machine and a weekend family boat. Since 1999, the Avengers have been hand-crafted one at a time with only the highest quality materials and meticulous attention to detail. All AVENGERS are backed by a lifetime limited hull warranty and 5 year stem-to-stern component warranty. All products are factory rigged and fully water tested to ensure that every system and component functions properly prior to final customer delivery. Welcome to the Avenger Family. 100% Hand-Laid Hull, Custom Rod Racks, 4 Spacious Floor Lockers, 50 Gallon Aft Release Well with High Speed Pick Up and Recirculation, Hydraulic Steering, Hydraulic Jackplate, Self-Bailing Cockpit, Custom Console and Storage Locker. » Please fill out our Contact Form for more information about our custom Marauder Marine Avenger Bay Boats.